Selling long-term appreciated assets results in gains that are subject to the capital gains tax. A tax-free solution isn't out of reach. A gift of appreciated property or a charitable remainder trust can help reduce your capital gains tax while advancing the work of a charitable organization you care about, like ours. If you sell long-term appreciated assets, your gains are subject to the capital gains tax. Of course, you can always leave appreciated assets to your heirs, knowing that your pre-death gains won't be exposed to capital gains tax. However, if you are looking for a tax-free solution now, neither of these possibilities may hold much appeal. You should consider a foolproof strategy that offers not only immediate capital gains tax relief, but also a valuable, tax-saving deduction and possibly even increased income. A gift to L'ARCHE of securities or real estate you have held more than one year is deductible at full present fair market value, with no tax on the appreciation. You receive another, priceless benefit from a gift of appreciated property: the satisfaction of knowing that your contribution will advance our work. Perhaps your budget won't let you make a sizable outright donation. You may like the idea, but you can't afford to give up any of the income that your assets yield. If you face this situation, you may find that one of our deferred giving plans is the right answer. Cash may not always be the best option for making a charitable gift to an organization like ours. Even when cash is available for a gift, consider a gift of appreciated property first. A gift of appreciated property can offer maximum benefits to the charitable recipient at a minimum cost to the donor, thanks to tax savings. No matter how tax legislation affects capital gains tax, it continues to be a factor in financial planning. For those with charitable interests, making gifts with long-term appreciated property instead of cash should always be considered. Even if cash is readily available for a desired contribution, ownership of marketable property, either securities or real estate, should first be reviewed. If an asset (1) has been held for more than one year, (2) is appreciated in value and (3) otherwise will be sold, a gift of the property itself is likely to be more advantageous than writing a check. Long-term capital gain property is an asset owned for more than one year, with appreciation in value that is subject to the federal capital gains tax when sold. If, instead, it is given to a qualified charitable organization like L'ARCHE, it is deductible for its full fair market value, and there is no capital gains tax to pay. If the asset otherwise is to be sold, now or in the foreseeable future, the federal capital gains tax avoidance is a tax savings to you. When added to the tax savings from the use of a charitable income tax deduction, the dual tax benefit reduces the net cost of your gift. The best stocks to donate are those that have increased greatly in value, particularly those producing a low yield. Even if it is stock you wish to keep in your portfolio, by giving us the stock and using cash to buy the same stock through your broker, you will have received the same income tax deduction but will have a new, higher basis in the stock. A stock portfolio is often among the most valuable assets you own, and one that carries substantial capital gain-appreciation in value. The downside to assets that have increased in value over the years is that the federal government is prepared to levy taxes of up to 15 percent on your capital gain from securities. With careful planning, you can reduce or even avoid federal capital gains tax. We can show you how charitable giving may be one of your best defenses against capital gains taxes. As stock prices increase, so do the taxes you owe on the capital gain, which are generally charged at a rate of 15 percent (5 percent if you are in the 10 percent tax bracket). 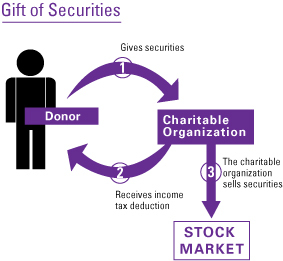 But when you donate publicly traded stocks held long term (owned for more than one year) to a qualified charitable organization such as L'ARCHE, you avoid all capital gains taxes. Plus, you may take the full fair market value of the stock gift as a charitable deduction on your income taxes. The maximum deduction you may take within a given tax year is 30 percent of your adjusted gross income. If you are unable to take the entire deduction in one year, you may carry the excess deduction forward for five additional years. Even if you own stock you wish to keep in your portfolio, giving us the stock and using cash to buy the same stock through your broker provides the same income tax deduction with a new, higher basis in the stock. If you have stock losses, sell the stock yourself to realize the loss and take the deduction for tax purposes. Then generate a charitable deduction by donating the cash proceeds of the sale to L'ARCHE. A charitable gift of appreciated property allows you to support a charitable organization and avoid paying capital gains tax on the asset. See how this unique gift idea could be of benefit to us, and how it could make a difference for you. When deciding what charitable gift to make, consider the type of property you own. While your home may be the biggest investment, many people also own other types of assets: publicly traded stocks and bonds, commercial business holdings, undeveloped property, farmland, vacation homes and tangible personal property (such as artwork, jewelry or antique furniture). Did you know that all of these assets are regularly used to fund gifts? Many of these assets have grown in value over the years. For example, a stock may be worth many times its cost basis. If a stock was worth $10 at the beginning of 1979 and has increased an average of 10 percent per year (growth plus reinvested after-tax dividends), it is worth $144 at the end of 2006. This means that an initial investment of $100,000, given the same growth assumptions, is worth more than $1.4 million. Many closely held businesses have grown in value even more. Usually, the business owner has a zero cost basis in the stock, often has received no or few dividends and today owns an asset of almost unbelievable worth. Income tax deduction. If you regularly itemize deductions on your federal income tax return, the first tangible benefit from an outright charitable gift is an income tax charitable deduction. The deduction is limited for gifts of cash to an overall maximum of 50 percent of your adjusted gross income in any year; you may, however, carry the excess deduction forward for five years. There is a special 30 percent limitation on certain capital gain property. Capital gains tax avoidance. If you sell an asset that you have owned more than a year, you pay up to a 15 percent capital gains tax (28 percent for "collectibles") on any appreciation (plus any applicable state tax). By donating the asset instead, you eliminate the tax on any capital gain. Federal estate tax reduction. Any gift you make today reduces the value of your estate at your death. The result is a reduction in the federal estate tax, which might otherwise be due when your beneficiaries inherit your estate. For more information, contact L'ARCHE Executive Director Marty O'Malley or a Member of the Planned Giving Council.